“Cheekwood in Bloom” is March 9 – April 7, 2019. Visit the gardens to see more than 150,000 blooming bulbs. On Saturday, April 6, “Spring Essentials for Growing Healthy Roses” will be held in partnership with the Nashville Rose Society in the Potter Room. 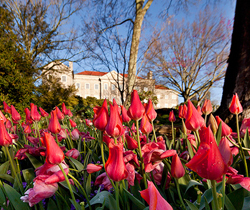 Admission or membership to Cheekwood is required to attend the event. For more information on “Cheekwood in Bloom”, visit the Cheekwood website.